Use the black Pirate hat and eye patch if you have no problem with using up black ink from your printer. Use the white Pirate hat if you want the kids to color the hats on their own. 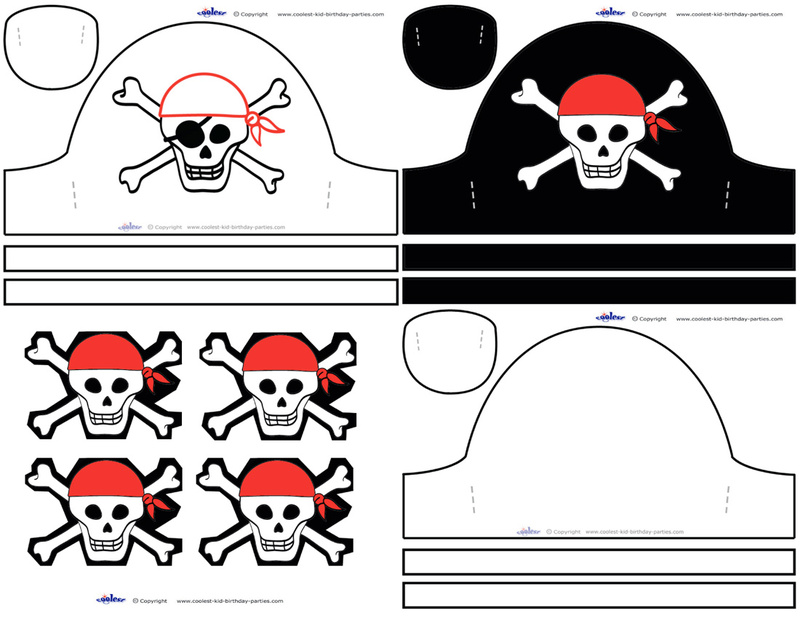 And use the blank Pirate hat if you don’t want to use up so much black ink (just print on black paper), then print out the Skeleton and Crossbones add-ons (the least amount of black ink possible) – and just glue each Skeleton and Crossbones add-on to a black Pirate hat you printed out on black paper. Cut out the eye patch and where you see the dotted lines make a little cut, then insert one side of an elastic string, tie, and fit to a child’s head. For the Pirate hat, you can either attach each Pirate hat with elastic string, or cut out the two long strips and staple or glue together to fit around someone’s head. Don’t attach strips or string to the far ends of the hat, but rather to where the dotted lines are (that way the far ends don’t bend).